As far as I know, Sir Ian’s version is not available on video. 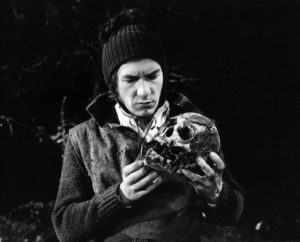 So at work the other day, my CEO asked which Hamlet was my favorite. At the time, in context, I assumed that he meant film version, as in, something that other people could then go watch. Not a live production that, if you missed it, telling somebody that it was your favorite didn’t serve much purpose because they couldn’t go take advantage of that information. I decided to ask the question on Twitter. I had no idea I’d get the kind of response. Taking out the people who pretended not to understand the question (answering with the names of cozy little villages, or “Q1”, etc..), I still got over 20 different Hamlets to choose from. Not all of them are available on video, but that’s been changing lately with live broadcasts of many. For the record I’d not even heard several of these names, but was happy to discover them. Some performances are even on YouTube in full! Did you get to vote? Who is your pick? For the record, I told me CEO Branagh was my choice because as I said I was limiting myself to film versions I thought he might have a chance of seeing if he wanted to. I wasn’t going to give it to Mel Gibson or Ethan Hawke, the other two that leaped immediately to mind. At the time I didn’t even think of Tennant, but on reflection I think I’d still keep my choice as Branagh. I found Tennant’s a little too … hyper? OCD? Can’t remember the words I used at the time. But then we start to get into a debate about whether we’re talking about the movie as a whole, or about the character. It’s probably true that Tennant’s Hamlet character was better than Branagh’s, but I like Branagh’s movie better as a whole. So many choices! I haven’t seen all of these, which gives me a list. My favorites are from stage. Live – Michigan Shakespeare Production from a few years ago with Shawn Pfautsch. My nephew was in middle school. My brother brought him to Hamlet and he asked to come back for more Shakespeare, due much in part to Shawn’s performance. For filmed theatre, Benedict Cumberbatch was otherworldly. My husband, who is not a huge Shakespeare fan but has seen much, was ready to see it again. So much energy and direction.